Israel's deputy defence minister has said Israel will have "no choice" but to invade Gaza if Palestinian militants step up rocket attacks. Matan Vilnai said Palestinians risked a "shoah", the Hebrew word for a big disaster - and for the Nazi Holocaust. 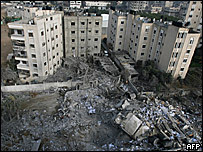 Mr Vilnai made the comments after rockets hit the city of Ashkelon, 10km (six miles) from Gaza. His colleagues insisted he had not meant "genocide". Hamas leader Ismail Haniya said it was ready for a large-scale Israeli attack. Israeli air strikes have killed about 30 Palestinians in the past three days. The string of attacks came a day after a rocket fired by Hamas killed an Israeli student on the outskirts of Sderot, about a mile from Gaza, the first such death in nine months. The barrage continued on Friday with militants aiming several Grad rockets at Ashkelon, home to 120,000 people. The Iranian-made rockets are said to have a range of about 22km (14 miles). One rocket hit a block of flats in the city, breaking through the roof and slicing through three floors below, while another landed near a school, wounding a 17-year-old girl. It is the first time Israeli officials have ordered Code Red sirens to be sounded in Ashkelon and reports say soldiers from the Israeli military's Home Front Command have been hanging posters around the city instructing residents on what to do when the warning sounds. "It's a city with large facilities - a huge soccer stadium, and a basketball stadium, and a beach. No-one is ready for this," Ashkelon mayor Roni Mehatzri told Israel Radio. Israel's leaders have been under pressure in some quarters to launch a ground invasion of Gaza to end the rocket fire and although they are reluctant, Mr Vilnai admitted on Friday that they will have "no other choice". The BBC's Katya Adler in Jerusalem says many of Mr Vilnai's colleagues have quickly distanced themselves from his comments and also tried to downplay, them saying he did not mean genocide. "We're getting close to using our full strength. Until now, we've used a small percentage of the army's power because of the nature of the territory," he added. Separately, the chairman of the Knesset's defence and foreign affairs committee, Tzachi Hanegbi, said Israel "must make a strategic decision to order the army to prepare quickly". A recent opinion poll has indicated a majority of Israelis favour a truce with Hamas. The Islamist movement, which seized control of Gaza in June, has said it will cease fire if Israel stops its military operations in Palestinian areas and ends the blockade of the territory which has cut essential supplies to its 1.5m inhabitants. Addressing a crowd of around 2,000 Hamas supporters at a rally held after Friday prayers in Gaza City, Mr Haniya, a former Palestinian prime minister, said Israel was deluded if it thought it could now remove his group. "Gaza today faces a real war, a crazy war led by the enemy against our people," he said. "What does a large-scale raid mean? You were in the Gaza Strip and you quit because of the resistance. What does assassination mean? If some leaders are assassinated, would the cause be assassinated?" he asked. Mr Haniya, who was dismissed by Palestinian Authority President Mahmoud Abbas after Hamas ousted his Fatah movement in Gaza, said any Israeli attempt to invade would "end in terrible failure just like all the other rounds have failed".